← How to Import and Edit iPhone MP4 Video to Avid Media Composer? Handbrake is a free and open-source video transcoder which is available for Linux, macOS and Windows. It is ease of use and offer presets for both quick conversion as well as more detailed options for advanced users. In the video tab you have a lot of advanced settings for your converted video. They include the video code (like H.264, MPEG-2, MPEG-4), framerate, video quality, bitrate and optimize video. You can select a constant framerate that you want if you want. You can set the quality of the converted video: the higher you set the quality, the larger the video size will be. So, you have the option of managing the video size as well. You can also set the bitrate which is the quality of the audio, it can also affect the size of the converted video. You can also set the width and height of the video by going to the Picture tab. There is also an option of cropping the video by selecting the area for the top, bottom, left and right. This is a great feature for some of you who are advanced users in multimedia. You have the option of adding your own subtitles to any video. You can import a SRT file if you have one, which is a file containing subtitles. This software gives you the ability to add audio tracks to a video. You can add multiple audio tracks to a video in which the viewer can select the audio stream from the video player that he is viewing it from. You can also name the audio track to your liking. There are various advanced options like selecting the audio codec, setting the bitrate, the samplerate, gain, etc. Another interesting feature of Handbrake is that it allows you to add chapters to your videos. Chapters are sections in your video where by selecting a chapters you can play the video directly from a specific position as set up in the chapters. This can be really useful when you have videos which have different sections in it. You have a list of popular devices with their presets already set up. You can select your device like iPod, iPad, AppleTV, Android Tablet, etc. and convert the video accordingly. This can be a great feature for absolute beginners. 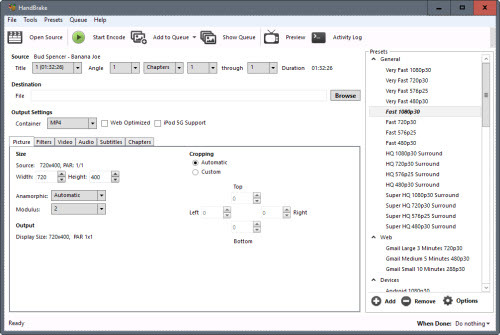 - One of the major pros of Handbrake is that it is open source and free for download. – It gives advanced control to users when converting videos like setting the width, height, codec, framerate, etc. according to the user. – Handbrake can also process BluRays. – It offers presets for Android and iOS which makes it easier for the user to set the settings according to the device which he/she has. - Handbrake can be challenging for a beginner to use because all the advanced settings can confuse the user. – The Graphical User Interface is not so easy. -Versatile video editing functions: rotate, trim, merge, split, watermark, effect, subtitles, etc. How to Downsize VOB with Ease on Windows/Mac?